The Hybrid blade incorporates the benefits of a traditional frame and steps it up a notch with an aero style cover featuring “Pass Through” technology to greatly reduces blade chatter and wind lift at higher speeds. A traditional exo-frame design enhanced with more pressure points to provide a smooth, clean, streak-free wipe with easy installation. The flat blade's frameless design contours to the shape of your windshield to provide equal pressure points across the blade for even wiping, while reducing snow and ice buildup during winter. 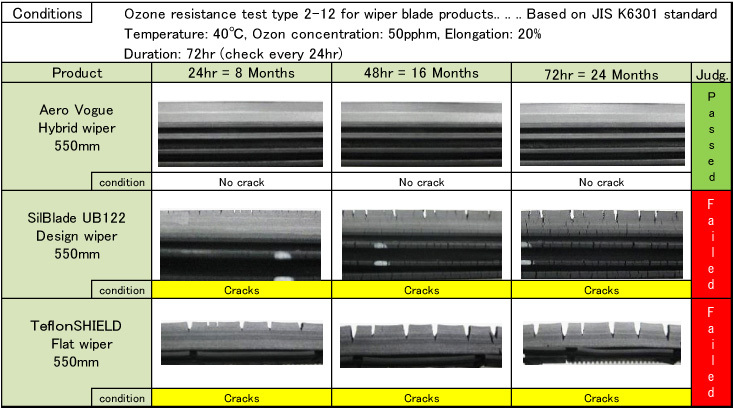 All PIAA wipers are subjected to durability testing. We follow the strict Japanese Industrial Standard (JIS K6301) method for physical testing of vulcanized rubber. Below you can see the results of PIAA's silicone blades and some results of the competition. PIAA Corporation, USA (“PIAA”) warrants the Super Silicone Wiper Blades to be free from defects in workmanship and materials under normal use for one year from the date of purchase. This Limited Warranty specifically excludes damage resulting from “acts of nature”, misuse, abuse, neglect, alteration, modification, improper installation. The silicone rubber is considered a consumable and is therefore excluded from the provision of the Limited Warranty. Except for the Limited Warranty stated above, there are no warranties of PIAA products or any part thereof, whether expressed or implied. Any implied warranty of merchantability or any warranty of fitness for a particular purpose is expressly disclaimed. Some states do not permit the disclaimer of implied warranties. If a PIAA Super Silicone Wiper Blade is suspected of being defective, it must be returned to an authorized PIAA dealer for warranty inspection. Removal, installation, or reinstallation costs are not covered by this Limited Warranty.